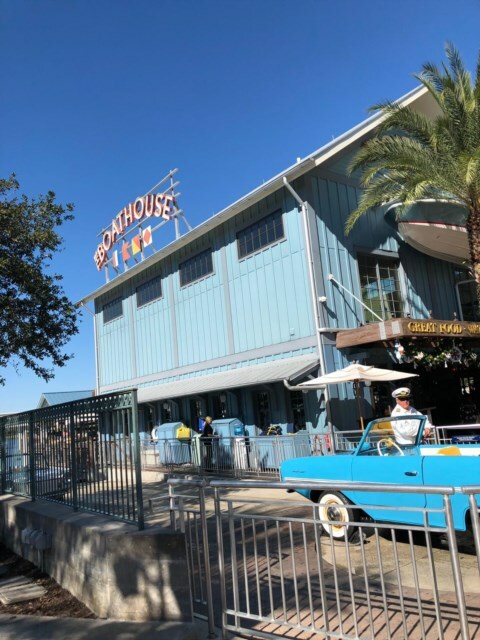 On a recent trip over to our villa, we decided on a trip to The Boathouse at Disney Springs. 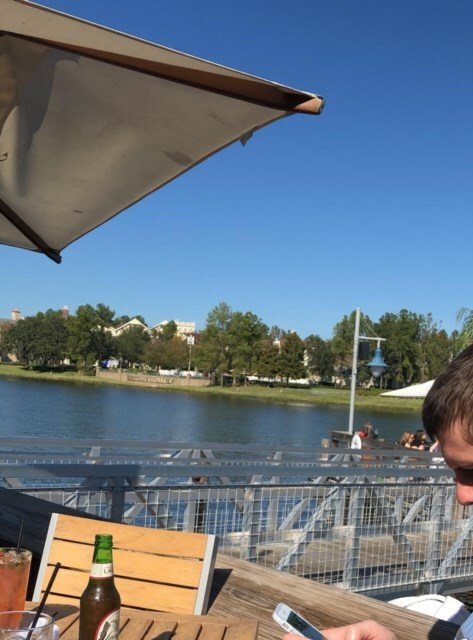 It was a beautiful sunny December day and we chose a table at the Dockside Bar, overlooking the lake and the views were just wonderful. 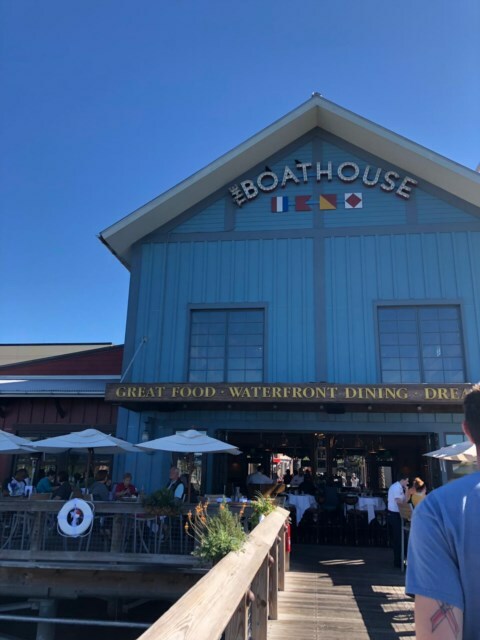 There are over 200 seats on the dock and at that time of year we had a good choice. There is also the more formal restaurant inside. 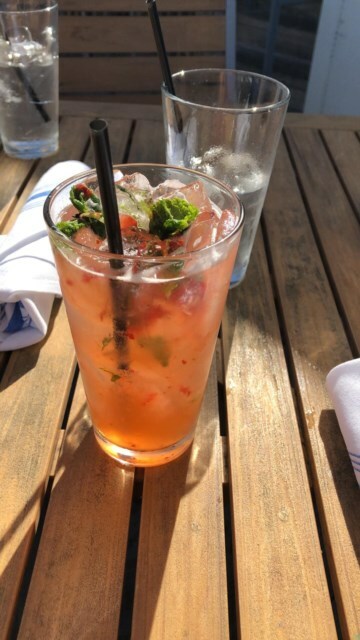 We decided to start with a drink and while my husband enjoyed his usual beer, I opted for a strawberry gin fizz, which just hit the spot! We were sat enjoying the view when one of the vintage amphibious cars ‘drove’ past! It was certainly a sight to see! 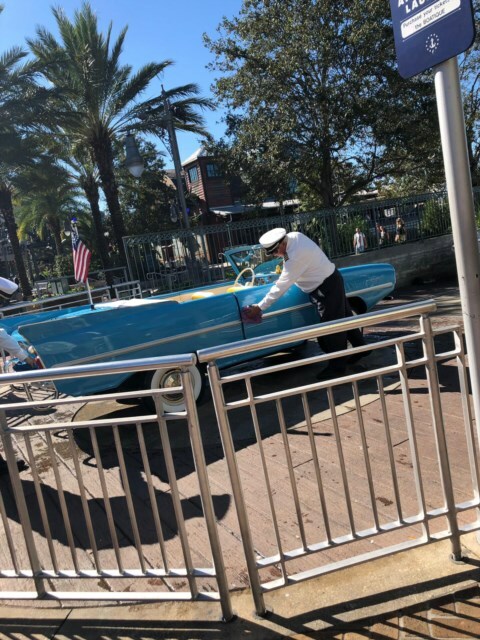 Apparently, there are less than four hundred of these rare cars left in the world dating from between the 1930’s to ‘50’s and it is a great opportunity to ride in one, driven by a white-suited ‘captain’. We enquired about the tours as we thought it would be good to bring the family next summer. Each car takes three to four people and a twenty-minute ‘drive’ costs $125 but we were told that if we spent $50 in the restaurant or shop we would get a $25 voucher which we could use so it is definitely worth doing if you intend to eat and drive. They also have a forty foot Italian water taxi which can be hired for special events and daily sunset cruises will start in the spring. Our food arrived quickly and that was no disappointment either. 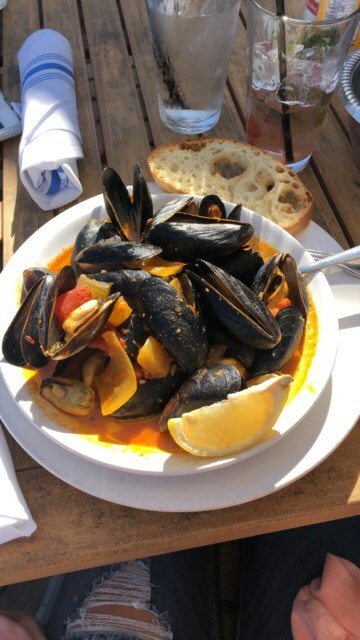 The menu, as you would expect for a riverfront restaurant, is quite heavily accented to sea food; lobster, oysters, shrimp, clams, swordfish, salmon… all sounded delicious but I went for the steamed mussels in Cioppino broth, (apparently that’s a type of Italian/American fish soup! ) and they were really delicious, fresh and so tasty and I felt reasonable at $16. 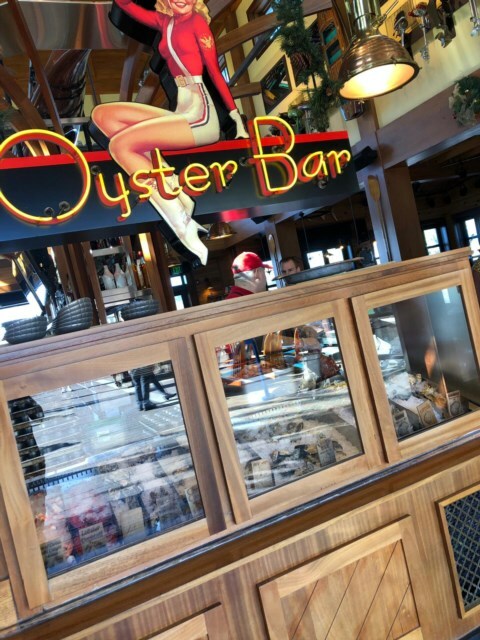 It isn’t exclusively a fish restaurant though with other choices including the usual burgers, sandwiches, salads and steaks. Though he was tempted by the twelve ounce Filet Mignon with Crab, I persuaded my husband that $64. 50 was a little expensive for a lunchtime snack! ! So reluctantly he settled for ‘Yacht Club’ Club sandwich at a more modest $17. 50. 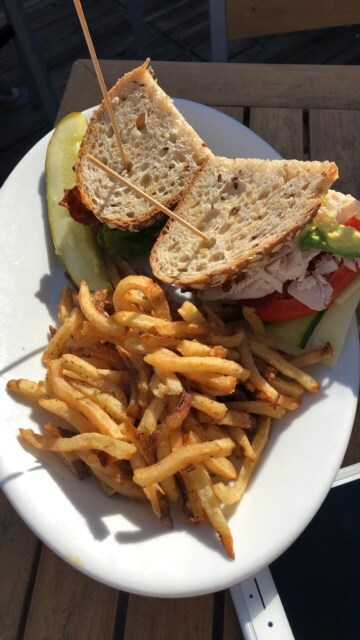 It was stuffed with turkey, bacon, avocado, cheese and salad and came with the best fries which looked just too tempting for me not to pinch a few! 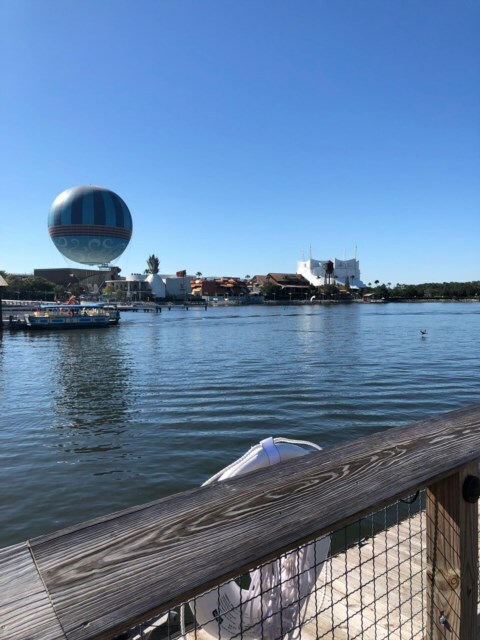 Of course, this is Disney, so everything is beautifully clean and well-appointed and there is the inevitable shop or ‘Boatique’ selling clothing, life rings and oars, which can be personalised and the usual collectables. Definitely a place we will return to with the family next year; it felt like a taste of Disney without the need for a park ticket. Viewed 140 times since 17 December 2018. A bit of spit and polish! 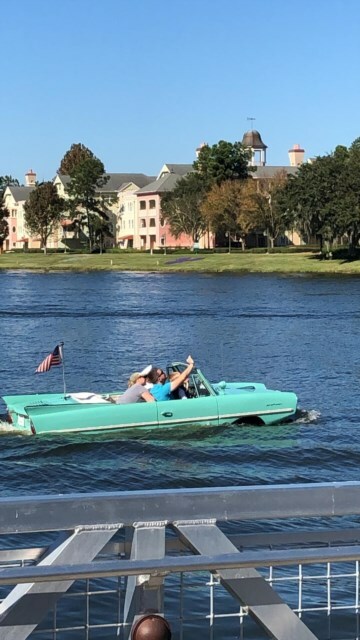 Is it a car or is it a boat? !